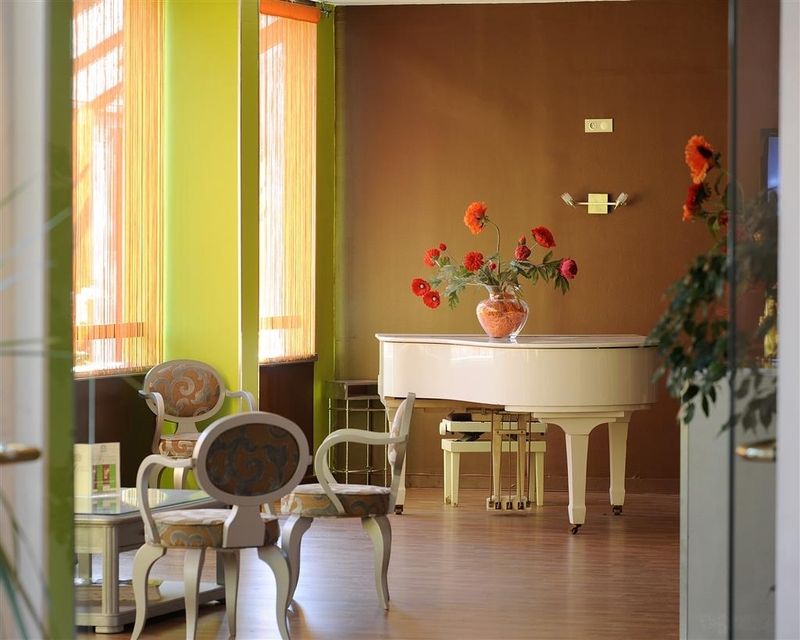 The Best Western Hotel Atrium is ideally located in the center of Arles. Come and experience our hotel near the major tourist attractions. Best price guaranteed and exclusive deals. Welcome to the BEST WESTERN Hotel Atrium! 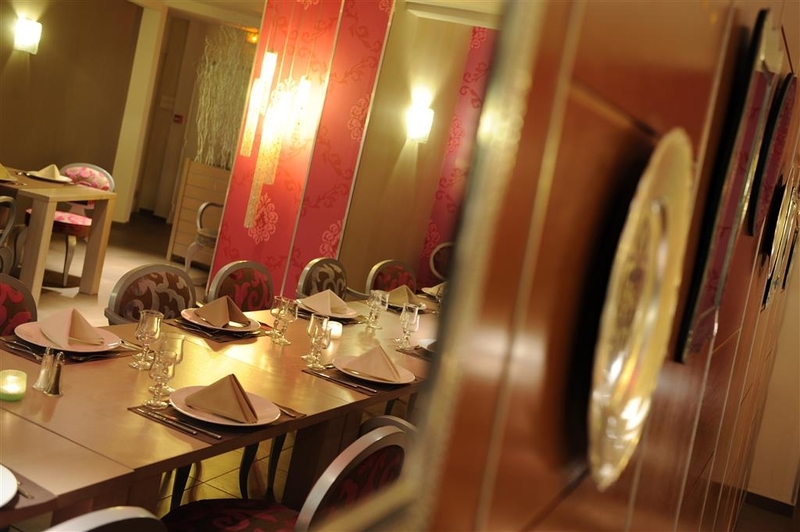 The Best Western Hotel Atrium welcomes you in the heart of Arles in front of the old city. Everything will be done for your comfort. Each of the 90 rooms provides with every comfort: air-conditioning, sound proofing, private bath, satellite television, direct phone lines, Wi-Fi and free Internet access. Traditional regional cuisine is served in a cozy atmosphere. 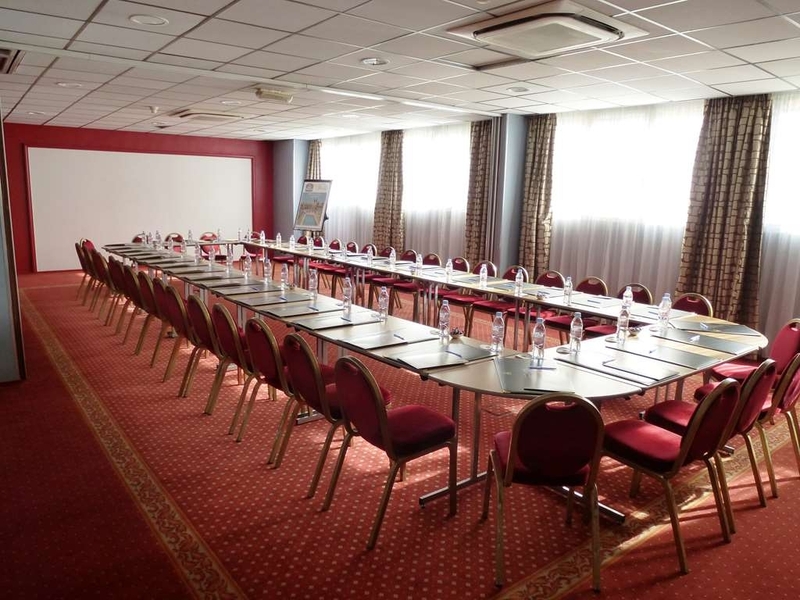 The hotel can also organize business meetings. 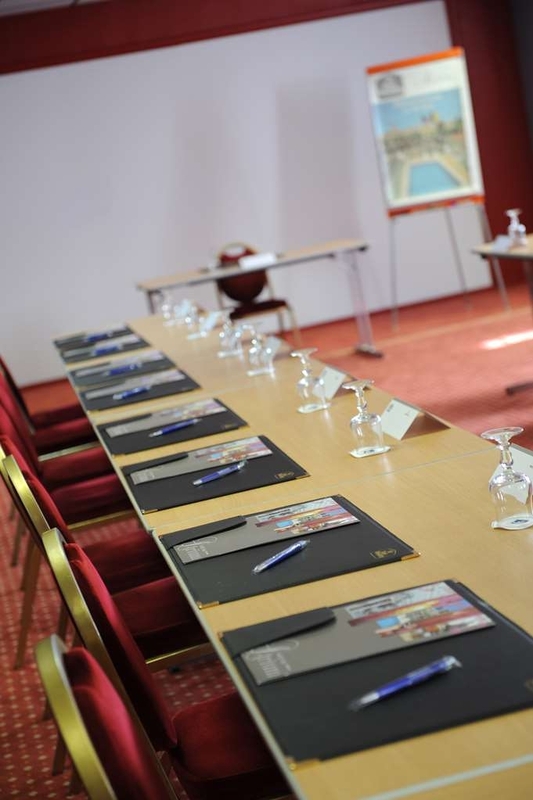 The five conference rooms have a capacity of 200 persons and are equipped with up to date conference facilities, translators (on request) and resident staff who are here to help you with your every need. Our roof top swimming pool is available with the beautiful view and billiard on our Lounge Piano Bar. "I GOR MY LAPTOP STOLEN BY THE CLEANER"
i went to arles to work with a team who booked my stay for one night. the place is old-fashioned yet comfortable and i was kind of liking my stay there. we left the hotel in the morning around 9:30 to go to camargue for work. unfortunately i don't have a great memory so it happened that i forgot my macbook on the top of my bed with its charger and my phone's one and i realized when we were about to leave the city we were staying in. as soon as i realized - it was after lunch, so not many hours later - my boss called the hotel to inform them and ask about the laptop. the receptionis answered the phone and said there was no computer and that she was sorry, so he handed me the phone and i told her that it wasn't possible i was robbed (she was assuming so all the time) while in camargue because i had my bag underneath my arm all the time and that i was 100% sure i left it there. after keeping on telling me that she trusted her cleaner and that i was robbed she hung on me out of nothing! so we led there and jessica, the receptionist i've been talkin to all the time, wasn't really prone to help us. she was annoyed by our presence and was refusing to translate some statements for us to the cleaner that didn't speak english, because she trusted her cleaner. we asked to speak with the boss but apparently there was no boss!! then they showed our room and the cleaners was constantly saying the disposition of the things i left in my room. (in 5 floors or so of rooms how come she remembers PERFECTLY the disposition of mine?) they went through the dirty sheets to look for it in the meanwhile the three kids of the lady were staring at us really badly from the cleaning room. i repeat she was constantly describing the disposition of the things i left in my room and telling, not even that she was sorry, but just that i'm a mean way. i kept on saying that i was sure i left it there and after a while of not helping me, the receptionst let the cleaner go away, who rudely asked us if we wanted to go through her empty bag. after a while nobody wanted to help us because she TRUSTED HER CLEANER (that's the reason she wasn't really willing to help us) we called the police and left. but i had to take my time to write how the staff there is unorganized and unprofessional. they were rude and disrespectful, couldn't remember who cleaned my room by the time i left (because at first it was that cleaner then they said it was another and then they changed completely the story because jessica wasn't there in the morning), plus they were acting really snob as if we were there to mess up. i repeated many times that i didn't want to mess up or nothing, i just wanted my computer and to go home because i was tired. and the only answer i got all the time was ‘there's nothing i can do because my cleaner never did something like that'. i hope that justice and some superior will intervene in this situation and please if you go there mind your things because of their tendencies to take thing that aren't theirs. "Great location; friendly helpful staff." Our stay in Arles was even better than we had thought it might be. So many Roman ruins to visit and this hotel is in a prime location that allows walking to all attractions. Hotel staff weree particularly attentive and helpful. We were here for 2 nights, room was well stocked and comfortable and breakfasts good. I enjoyed the tiny roof top pool as well. It's just slightly off the tourist trail but easy to walk everywhere. One morning the place had been stripped by a coach party and the breakfast took a while to recover, but it was OK.. 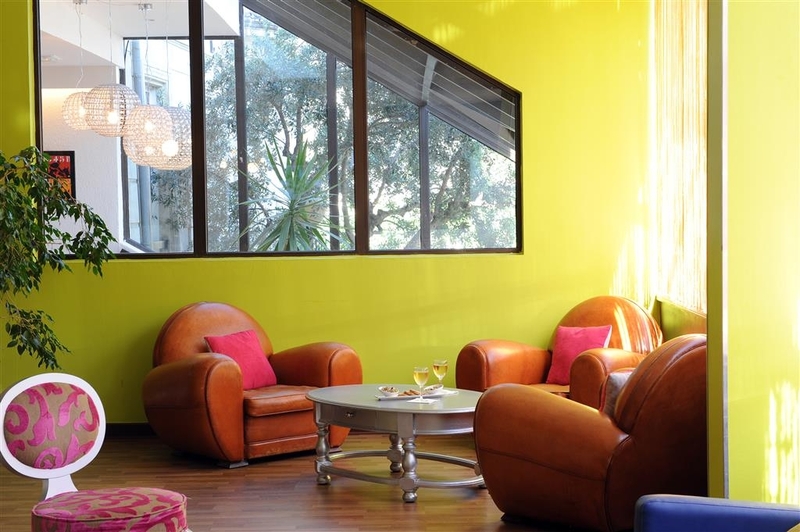 If you are looking for a simple hotel in Arles, this is the place for you. Rooms are moderately renovated (nice new bedding but not the 80s feel bathrooms), the hotel is clean-ish (not a 5 star, especially the toilet room), the staff if really friendly and helpful (but sometimes understaffed at rush hours). Parking is simple (a few places underground, a public parking lot nearby and easy free parking in the surrounding neighbourhood streets). It is easy access by foot and conveniently located across the Tourism center and the Saturday Market. A pool on the roof, breakfast service (we didn't go), they also offer luggage service if you want to check-in early or check out late to visit. The WIFI was AWEFUL (basically none) in our room at the end of a hallway. 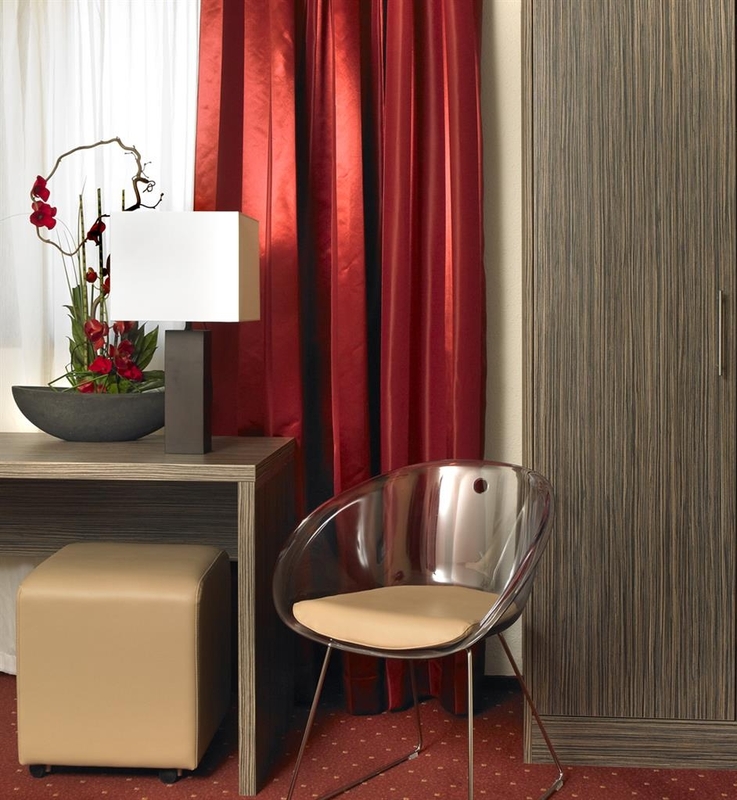 Ask for a room located more centrally. Affordable stay all in all. "Great Place to stay in Arles"
Really enjoyed our stay at the Best Western Hotel Atrium. The rooms were spacious and clean and the breakfast had a good variety. Excellent location, very close to the old town but quiet. Friendly staff and a comfortable foyer, where you can relax and read the paper. Lovely upstairs terrace and swimming pool are an added bonus. Would recommend staying here when you are in Arles. "very comfortable hotel in excellent location "
We spent 3 nights in the hotel - 2 couples visiting the area. Rooms were comfortable, clean and with lots if space. Although central, the hotel is very quiet. Breakfasts are good. The hotel caters for large bus parties and several came and went during our stay - but the hotel coped very well with this and with small groups and couples at the same time. Breakfasts are good with a fair selection. Staff are very helpful and friendly. Biggest plus is location - all the main sights of this lovely town are within easy walking distance. "At Hotel Atrium with a group"
The position of this hotel is excellent, also for our group that some days were picked up by a medium sized tourist bus. Our room was all right, but not really first rate. The breakfast was also all right and with a reasonable choice, but not something we will remember. We had one quite good evening meal, but generally preferred to walk into the central part of the town. No bar. "Good location and pleasant easy place to stay"
The hotel is in a very good location, just outside the old town centre and behind the tourist bureau. Good reception and check-in process. There is a lift up to the rooms. Our room was very comfortable, clean, had crisp linen. We parked safely on an adjacent street as the hotel carpark was full. Only the breakfast was a bit disappointing and we thought it was overpriced for what it was. However, overall, we are glad we stayed here and would do so again. "Delightful hotel in Excellent location." 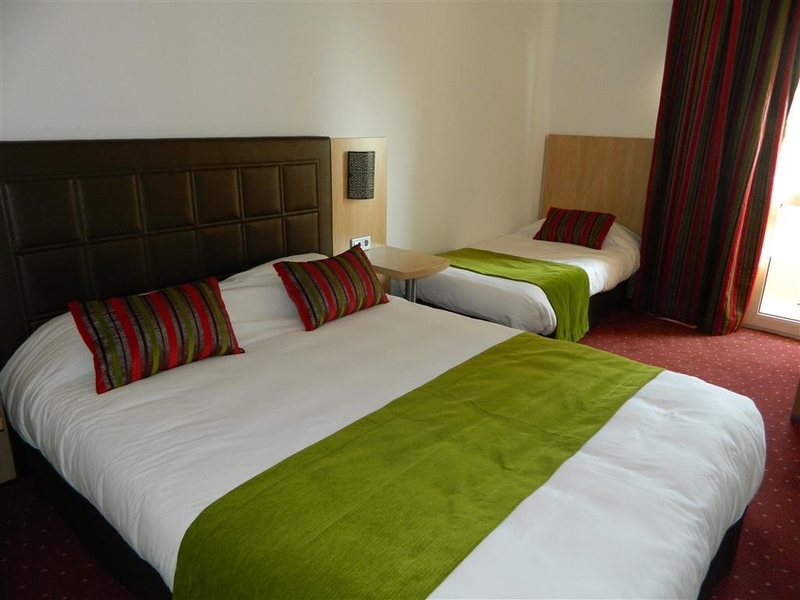 We choose this hotel as it offered excellent on site underground secure parking which is easy to find. The hotel was delightful, comfortable bedrooms, helpful staff. A large breakfast buffet was included in the room rate which was good except for the repulsive looking scrambled egg, very off putting and definately did not try it. Everything else was fine. "A Nice Stay in Arles"
We've been on the road for almost three months now and have spent countless nights in hotels. This property was one of the better ones, particularly given the rate we paid. The room was clean and spacious, the wifi some of the best we've had so far, the staff friendly, helpful and could communicate in English, a bonus for us as our French is not that good. A convenient location just outside the historic center with a market nearby and plenty of good restaurants. We would definitely stay here again. It is an older property but shows signs of proper maintenance. "Not worth the price but not much choice in Arles"
- Reception staff has only basic English knowledge - Room was in terms of size and setting OK but toilet stinks of urine. I guess it's never washed properly as there's no water or sink in the toilet which is separate from bathroom. However this seems to be the case in many toilets in France.. - Breakfast of bad quality. Greyish(!) scrambled eggs (see photo), raw bacon, missing items not replaced - when asked, received just a reply "sorry, it finished"- at 8am... No parking available at all at the hotel. Either parking on street it in a nearby public parking hall for 18Eur/24h. Pool closed already in October although no mention in the website. In general, not meeting the normal Best Western standard. Second worst BW hotel after Riga. If you travel by car, I would avoid Arles in general and stay somewhere close to the sea or mountains. The air quality is awful due to some industries it seems. Every afternoon there was a smog that itched the throat. The hotel itself is fine but what made my experience particularly special was the care and concern shown to me by the staff. I fell ill one night and they could not have been more understanding and helpful. I am very grateful to them and would like to highlight how they make the hotel exceptional. I can certainly recommend it. Having read some of the reviews, I was confidant that this would be a lovely hotel. It is in a very convenient position but apart from that I have to say I would not return here.The food was very ordinary and twice at breakfast the orange juice had run out. It was difficult to find a member of staff when you wanted something. Wednesday evening we went to the "bar" for a drink before we went out for a meal but there was no staff there. I went to reception to enquire and was told the restaurant was closed. Not understanding why it affected the bar the receptionist was very brusque, no apology just told me there was no one there to serve us! Quite strange as there was no notice up. It was totally lacking in atmosphere as well. Please fins another hotel in the area as this seems to be a hit or miss hotel and I would sooner give it a miss. "Great location close to all of Arles' important monuments!" We enjoyed staying in this extremely clean, well-located hotel. Three of us stayed in one room and found it to be spacious enough for us and our luggage. The towels were soft, large, and sparkling. The beds were comfortable and the staff were extremely friendly. It was within walking distance of most of Arles' points of interest. I would stay here again. Parking in the underground garage was a challenge, but space in the center of an ancient town is at a premium. We were in NY celebrating our 35th anniversary and the hotel was in a fantastic location to walk to museums and great restaurants. The staff was very attentive and they sent up a bottle of champagne which was delicious. The room was beautifully appointed and very luxurious! Will definitely stay again if we go back to NY! "Good machine hotel in excellent location"
Best Western hotels are much of a muchness. Rooms are clean, staff usually efficient and helpful, food OK, and so it was with the Atrium. We stayed longer than most (they do coach parties) and were moved from 127 (v small) to 103 (fine). The reason for the initial choice was that they were honouring our request for quietness, which is excellent, but we found 103 tranquil also. It being the end of the season, with the winds getting up, the roof terrace service was suspended, so that one could not get a lunch time snack in house, and the pool, itself very small, was chilly. If you value these things, best to go before the end of August. The hotel scores a bullseye on location. It is 100 yards from the first-rate tourist office and a few yards more to Clemenceau, with its long lines of restaurants, and the ancient centre of Arles. The staff, especially reception and Fred, a star waiter, were fine Well recommended for what it is: i.e. a rather impersonal hotel geared mainly for short-term stayers who need a reliable bed and breakfast and spend their days and evenings elsewhere. This is a splendid hotel in the very heart of this historic town. Clean and well appointed. Breakfast excellent. Sadly didn't have time to enjoy the lovely looking swimming pool. Highly recommended !! "A classic NY hotel at the best location"
This hotel combines traditional style at the highest level. The quality of the hotel experience is memorable. 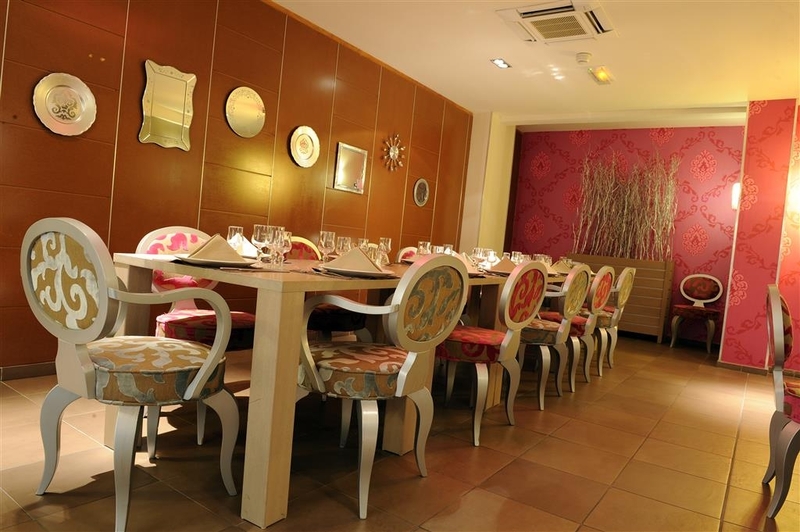 The service impeccable and the location is the best in the heart of the city. This remains my go-to hotel in NYC. The staff at The Pierre is so genuine and caring, you feel welcome the minute you walk through the door. We were there for an extended stay of 14 nights, as I was in NY for surgery. It was so comforting to be in such a lovely hotel, located across from Central Park, within walking distance to fabulous food and entertainment PLUS.......did I mention "The Staff"!!! I'm already looking forward to a return visit in October and wouldn't dream of staying any place else. The Hotel Pierre is a great hotel in the heart of NYC East side. I highly recommend the hotel. 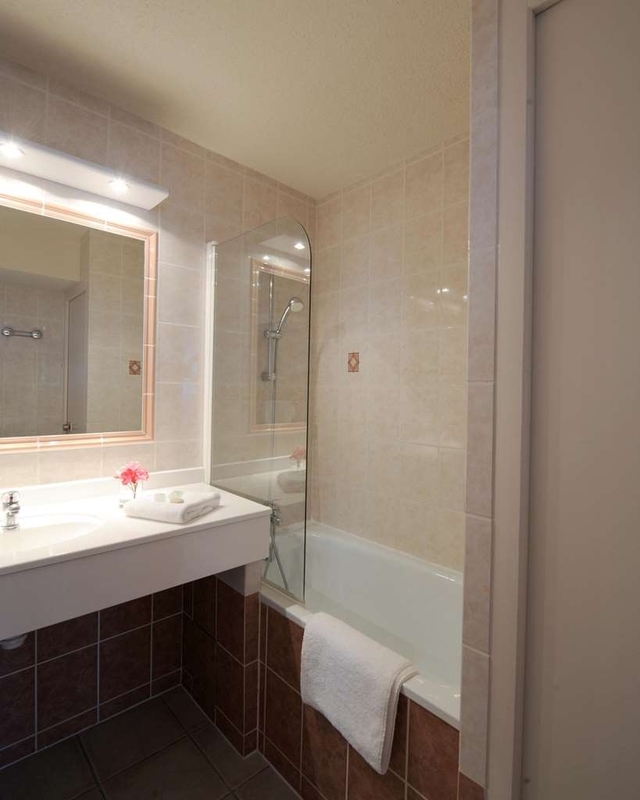 The rooms are super clean with modern bathrooms. The Pierre Hotel has excellent views of NYC and is located across from the famous Central Park. "Was probably really at one point"
Let me start by saying the staff at this hotel make the stay 110% better. The hotel overall is not anything special. It is old, outdated, smells of mildew and/ or cigarette smoke, the key card stopped working four different times. The rooms are small and the views arent great. The pierre is comporable to the Waldorf (not the towers) pre-renovation: you can tell it was amazing when it was first built. But now its a 3-4 star hotel at best. "Excuisite stay @ the Pierre NY." Absolutely lovely location, staff, service food. Located in the heart of the city. If i could make any changes would get more full bodied tea i.e Tetley / Twinings etc. But that said amazing experience will come again and again. "Amazing property and incredible service"
This was my first time staying at a Taj property but it was an awesome experience. The property itself was very beautiful and the service was top notch. That added to the convenient location of being right on CentralPark makes this a must stay place. "Shangri-La GC diamond transfer to Taj IC platinum card"
First time stay at Taj hotels, I still like Shangri-La hotels better! With free breakfast and lounge excess from Shangri-La Diamond card but not from Taj platinum IC. Taj needs to change better benefits to attract more Shangri-La customers! "My stay at the Taj"
It was a great experience there and I would stay again. The staff was accommodating and always had a smile. The room service was great. We are at one one the restaurants which was also great. The location worked well as it was across the street from Central Park. "Old world charm FIRST class service"
The Pierre is seems intimate & charming. Everyone knows you by name & the elevator operators(!! )are warm & welcoming. As is everyone who works there. The location across from Central Park & adjacent to the Subway is perfect. We walked to Broadway every nite, a quick 10-15 minute walk . Honestly, they thought of everything. Don't miss the bowl of chocolates on the front desk. Worth every calorie the room we had was spacious & just perfect. We will definitely return. Hopefully soon! "My stay at the Pierre"
This was my first stay at the Pierre. Me and my family were very impressed. We were given excellent service. It was very relaxing. The location on 5th Ave and Central Park was perfect. Transportation to and from this hotel to major sightseeing venues was easy to obtain. I will stay here again in the future. You feel like home, staff super nice, suite big and well decorated, in front of central park, on 5th ave, very exclusive, dont see many ppl on the lobby, they call you by name, private car it was s500 benz, concierge very nice and helpfull...now is my home in new york! This hotel is centrally located. The room was very clean,bathroom clean, ice machine downstairs ,AC worked great. Our checkin was great considering a bus tour arrived at the same time...they are firm about 3 pm checkin time. We found parking on the street where we paid until 7pm and then again at 9am the next morning. You only have to really cross the street and you are downtown Arles...the real treat to this hotel. Hotel is right behind the Tourist Office, just off the main road & a short walk to the Roman Theatre, Arenas etc. Hotel was a strange shape, rather like two seperate hotels within one building & only the ground floor connected the two parts. Room was quite a good size, extremely comfortable bed & curtesy tray refilled daily. En-suite but with seperate WC & bathroom. Good buffet breakfast although you need to time it right as there were two tour parties when I stayed who all breakfasted together. Lack of bar was disappointing & although their is a rooftop swimming pool, it is very small although when quiet, a good terrace for sunbathing. I would NOT recommend this hotel to anyone. Our travel agent pre-booked this hotel so it was prepaid for ahead of time; therefore, we were stuck with it for three days, but it was not even worth a two-star rating. Our room furnishings were meager and shabby, with a very uncomfortable mattress, terrible breakfast and air conditioning that barely worked. As a result, we tried to plan as many day outings as possible just to avoid our hotel room as much as we could. "Practical choice for visiting Arles." Just outside the old centre of Arles, easy to access by car but just two minutes walk into the city; very convenient for Les Alyscamps. Good breakfasts and reasonable dinners, and effective air conditioning. Used by coach tours, but these were accommodated (rooms, breakfasts and meals) without impacting on us. It had a car park underneath, but we used a 6 day ticket for the multi-storey just down the road. As a group on a tour of Arles from a cruise ship, we were taken to this hotel for lunch. To me it was typical hotel food. The salad was good. The main course being chicken was dry, but when you servce this many people not all things will be done right. "Frustrating experience at BW Atrium Hotel in Arles"
The Atrium hotel is well located near the old city. Rooms are ample, shower above the bath tub a bit dangerous. Bed mattress is below par, one moves, the partner too!!! The breakfast isa bit industrial, no fresh fruit, watery juices, coffee is good though. Underground parking is good. You could not ask for a better location for a Hotel. Staff are very friendly and helpful. Fred the waiter in the evenings has a great sense of humour. Rooms are clean and tidy and the best white fluffy towels for miles !!! Bonus. We had the Buffett Monday night, it was amazing so much choice, salads , meats etc, and the desserts ..will come back. "Senior Managemet Style and Breakfast"
We stayed here for two nights, at the beginning of this month, as part of a short visit to the area. We arrived about 10.30 am, not expecting to be able to check-in until later, but hoping to leave our bags in storage. The receptionist was very helpful. Our bags were duly stored, but there was no clear indication of when our room might become available. So we said we would come back later, after doing some sightseeing and having had lunch. This we did, returning to the hotel just after 2pm, only to be kept waiting for some considerable time whilst a tour organiser paid over a large amount of cash, and then to be told that our room was still not ready. We were informed that the hotel had been full the night before, and that new beds were being put in some of the rooms. Not our problems, we thought. We explained that we felt that we had been quite reasonable in waiting this long for access to the room, but we were then told by 2 senior managers, in a particularly aggressive manner, that we would have to wait until after 3pm, the normal check-in time for a room at this hotel. So, we asked why we had not been told this before, and things went downhill from there. Eventually, we were told that if we wanted a room now, we could have an inferior ground floor one. We declined this. One of us did take up the offer of a free coffee whilst waiting for a better room, but we spent most of the waiting time in the nearby tourist office complaining about how rude the senior staff had been at the hotel. We received a shocked and very sympathetic ear from the tourist office staff, then returned to the hotel to finally claim access to our room. The room, itself was reasonably clean, quiet and comfortable. The bed could have been new! The décor was very "70s", however, (especially the carpet stains) as was that of the rest of the hotel. The cold scrambled eggs offered for both breakfasts were also probably from the "70s". We appreciate that this is a budget hotel but work really needs to be done on refurbishing the place and greatly improving client management techniques (as well as the breakfast). The management attitude significantly reduced our enjoyment of the latter part of our short break. The hotel seems to accommodate coach parties of teenagers, at least at Easter time, and management does not seem to be able to cope with the workload. "Cheap and cheerful. Good location for town." We spent three nights here whilst visiting Arles and surrounding area. All you might expect from a budget hotel. Clean and comfortable. Only two minutes walk from the centre of Arles town centre which was great. Visiting in February is was on the quiet side. The restaurant was only open on the one of the three nights we stayed, apparently because that one night, a coach party was staying over. Also I must mention, the many eateries in town were mostly closed, i'm sure because it was out of season. The hotel does boast a rooftop pool, but, alas, again closed in February. Would I stay there again? Yes, but probably not in the winter months. "Perfect location & Fantastic service"
Situated minutes from the vibrant hustle of Arles centre, perfect to explore this historical city. The hotel has a rooftop terrace and swimming pool to relax after a days sight seeing. 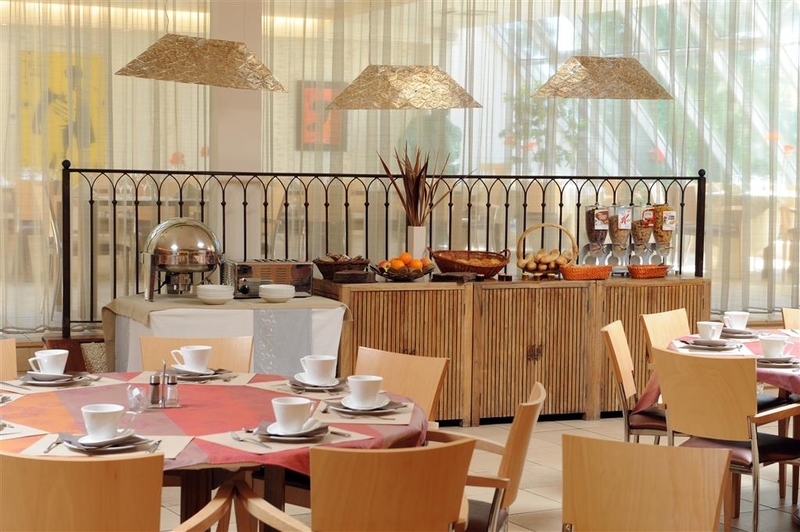 The breakfast atrium is welcoming and has a great choice menu and the dining room is initimate. The staff were extremely obliging and curtious. The only thing to pack is a kettle for those early morning or late night cuppas. We spent a two night break at this hotel and found it very comfortable. 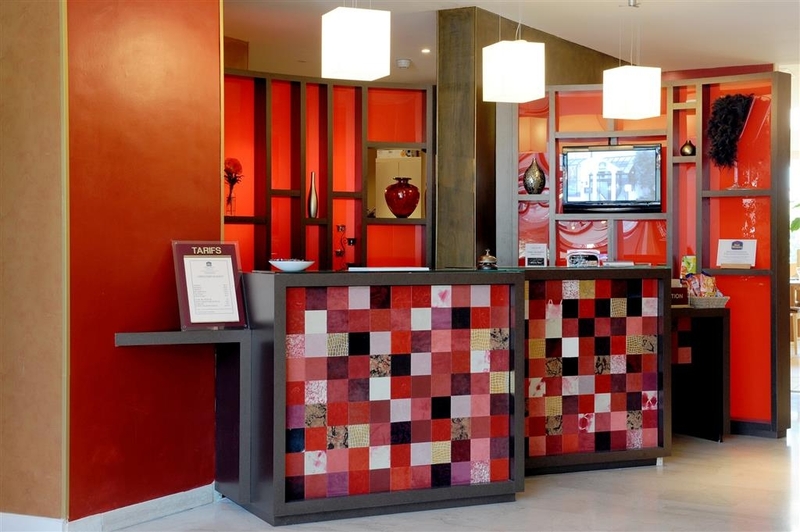 The reception staff were pleasant and efficient and the hotel is in a great location to access all that Arles has to see. Parking was also useful and can be difficult to find in the town at a reasonable price. We would certainly return the next time we visit Arles. Very good value for money. 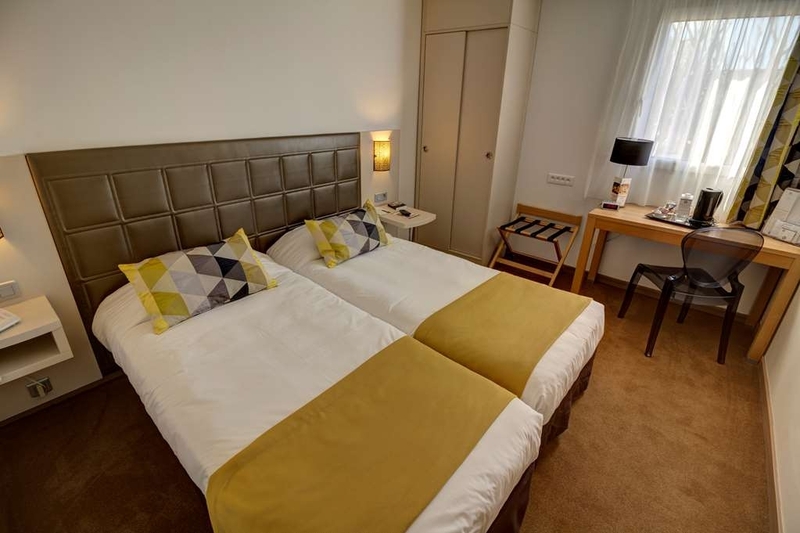 "Solid 3* (by Euro standards, 2.5* by US)"
Good location right on the edge of the old city. It's an easy 15 minute walk to just about everything you'd want to visit. OK amenities. OK room. OK wifi (with a very clunky security system). Parking spaces in garage are VERY small. Nothing very remarkable or memorable but a very good value at $44 EUR. This Hotel is rated 4 star on some websites, but it struggles to meet 3 star standards. It has a good location, average rooms, elusive (but pleasant) staff. It had a bizarre and unreliable wi fi system. There was no bar service at 10pm, although the lounge was full. If a guest wanted a drink they had to leave the hotel for a local bar! "Ideal if travelling by car"
This was not our first choice in Arles but turned out to be very good. The position is ideal, particularly if driving, as Arles roads are a nightmare and most of the hotels have no parking. This hotel is just outside the old city but only a short walk from all the sites and restaurants. Parking is under the hotel and is extra but well worth it. The hotel is a bit short of character but none the worse for that. Public rooms are dull but our bedroom was comfortable and a reasonable size. Good breakfast. 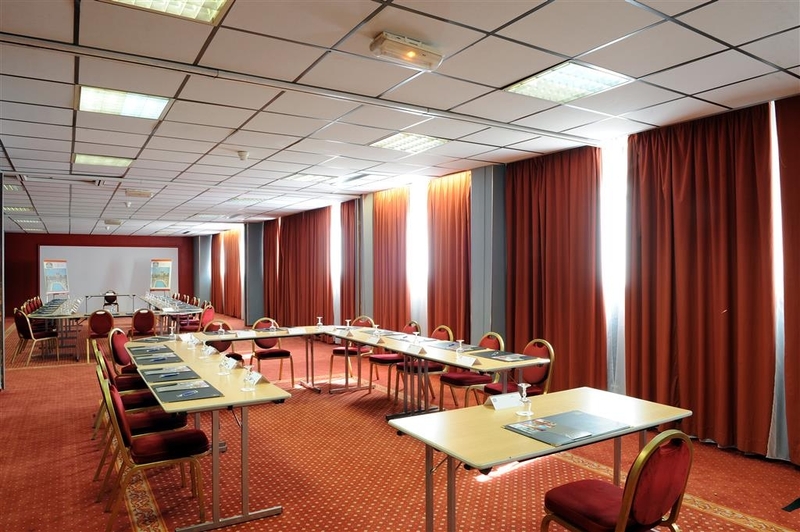 "Adequate hotel well located in Arles." Room clean with good bathroom. Limited storage. Excellent wi-fi. Coffee, tea-making facilities in the room - very welcome after a day's site-seeing. Breakfast has adequate buffet, but dining room very crowded with large tour group tables. Staff very pleasant and well organised. Best feature by far is the location. Very central and handy for the street markets across the square (twice a week). We had booked this hotel as it was one of the few close to the old city with parking. Parking in the Provencal towns is always and issue and Arles is no different. The hotel has an old section plus a new wing and our room was in the old part. Good sized room with a small balcony looking out across the suburbs. Small bathroom but everything in it so OK. Good internet connection. The hotel gets a lot of tour groups and the dining room is only open for these groups in the evening, but there are numerous restaurants in easy walking distance to the hotel. Our receptionist was delightful and a fund of information on the town and its restaurants. Breakfast had the basics but was nothing great. The main points of the hotel is the parking and location to the old city. The hotel was located just on the edge of town but close enough to walk to the main square, where the restaurants and the Van Gough Café are located. Also close to the old Roman Amphitheatre & Arena. The hotel has a small roof top pool and also a outside smoking area at the top of the old wing of the hotel. Car parking is available, but need to request it. Basic hotel but clean room – no complaints. We had a room in the newer part of the hotel. Fantastic shower. Breakfast was OK. Tea & coffee facilities in room. Great location. Lovely room and clean. Good to see coffee and tea facilities as a welcome in room upon arrival. So close to ancient ruins and old towns. Spoiler for choice for places to eat. Front reception could be more friendly and helpful. Overall, though highly recommend for your visit to Arles. This hotel just on the edge of town is unusual that it has a small roof top pool and lounging area ideal for relaxing after visiting the town nearby. I found the bedroom clean but quite small for a two day visit and situated on the ground floor by the busy side street it was noisy at night when the revellers made their way home. Breakfast was hardly worth having as there wasn't much left when we arrived so we just had the express one. The wifi was very flaky in the bedroom and we need to go into reception. The parking in the hotel was useful but would have been difficult for anybody with a large car. Overall it was worth staying here for the location...the tourism office is near by and the trips to the Camargue pick up from outside too, but I wouldn't want to stay here for too long. We stopped in Arles to break a drive from Bergerac to Roquebrune -- and we had never been in Arles so it seemed a good idea. Unknowingly we arrived the afternoon of the annual festival of bulls and cars were parked in every niche and sidewalk all over town, people were swarming through the streets and major streets our GPA wanted us to use to reach the hotel were blocked off. Two total strangers got in our car and guided us on back streets to the hotel Atrium where we had a reservation but there was no parking. It looked like a disaster. But the receptionist assured us that there would be a parking spot somewhere, suggested we offload luggage (we had huge suitcases as part of a 3 mos trip) and then gave us suggestions for finding parking. We ended up finding a guy pulling out of a spot about a mile from the hotel across the river and grabbed the spot. All gravy from then on. The room was spartan and tiny especially for the price; it was however, cool with decent AC, had a lovely small bathtub and best of all a giant room safe which held our computers as well as money, passports etc. It was quiet and the beds were fine. There was a kettle and coffee and tea makings. The breakfast is very adequate -- cold cuts, boil yourself eggs, scrambled eggs and bacon, yogurt, breads (toasters), baguette and pastries, coffee (machine), good juice, and fruits, honeys and marmalades. Breakfast ran 7-10. The hotel has a spectacularly good location. We walked less than a block to the running of the bulls, then wandered down into the old center for paella and a continuing party due to the festival. The next morning we stowed our luggage in their secure storage after a leisurely breakfast and took our time to see the town, the amphitheater, the arena, the Roman baths, the Rhone river. Lovely little town. The location could not be better for a visit to Arles and the room was tiny but comfortable and adequate. 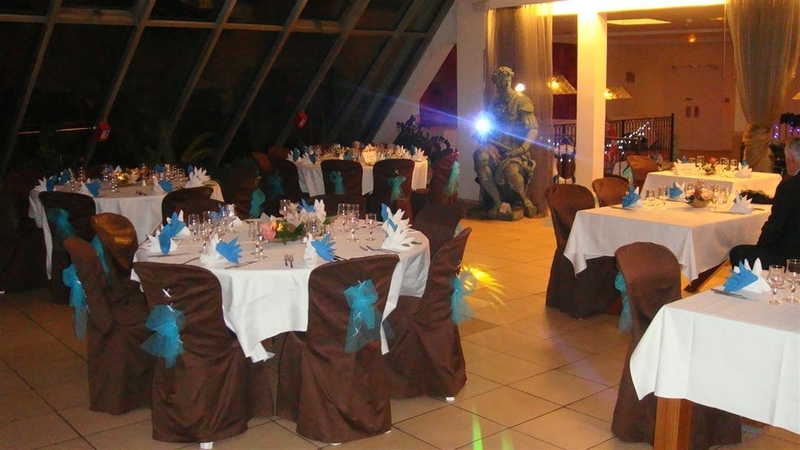 This hotel is situated in town within walking distance of the Romans Amphitheatre and Arena. We found a terrific Reasturaunt only a few minutes walk. Two bonus points go to it having a good underground car park, with also a swimming pool on the roof. Excellent staff The receptionist managed to check us in whilst dealing a coach load of Swiss tourist's. "Comfortable hotel near town centre"
This is well appointed hotel in a good position on the edge of the old town. A free shuttle bus runs from Arles train station to nearby. The room was spacious with a comfortable bed, room safe, and tea and coffee making facilities. The breakfast buffet was varied and some hot food was offered although the serving staff were a bit slow to replenish the empty serving plates. The best feature of the hotel is the roof area which has a small plunge pool and sunbeds and spectacular views over the surrounding area although no bar which is a shame. A small supermarket 5 minutes walk away provides basic essentials. We recently booked here for a couple of nights and reserved a parking space for our rental car. We were in the newer part of the hotel and had a clean room with desk, couch, comfortable bed, air con, huge television, WiFi, and electric kettle (but don't use it if the Internet is on as it blows the room lights). Staff was incredibly helpful especially in recommending local restaurants. The hotel is just outside the old walls of Arles and it's an easy walk to all the major sights. Highly recommended that one stop at nearby Tourist Office for combination tickets to Arles attractions and museums. Buffet breakfast in the dining room covered all the basics with juices, coffee machines, yogurts, fruit, croissants, cheese, ham, and jams. We would definitely stay here again. "Great location, poor service "
The central location is a big plus and with a reputable chain you usually know what to expect. The rooftop pool, although very small, is an extra bonus but it is VERY small. When we arrived after a long day of driving we had hoped for more help when the car park and surrounding streets were completely full. Our booking was last minute so no complaints that the hotel parking was unavailable, that was just bad luck. We must've circled the hotel block 5 times before asking for advice to which we received a simple shrug of the shoulders. It's frustrating when staff don't seem to acknowledge how much their attitude can hugely impact your whole experience of a place. We headed out determined not to be discouraged and had a great night exploring a beautiful town. We we arrived back I accidentally sliced my finger open when unzipping my girlfriends make up bag. It was bleeding heavily so I headed to reception where a man was chatting to the night receptionist. When they had finished he went behind reception and seemingly started doing something else after clearly acknowledging my presence. I rang the bell and he came out looking annoyed at me being there, when I showed him my finger and asked for a plaster he said we don't have one. I asked "you don't have a first aid kit on site" he'd already began walking away shrugging his shoulders and that was that. How such a reputable chain can not have a first aid kit on site is a huge cause for concern, regardless of the attitude of certain members of staff this needs addressing as soon as possible. My cut was minor but someone could easily require treatment for something more serious. I would think twice before booking here again. 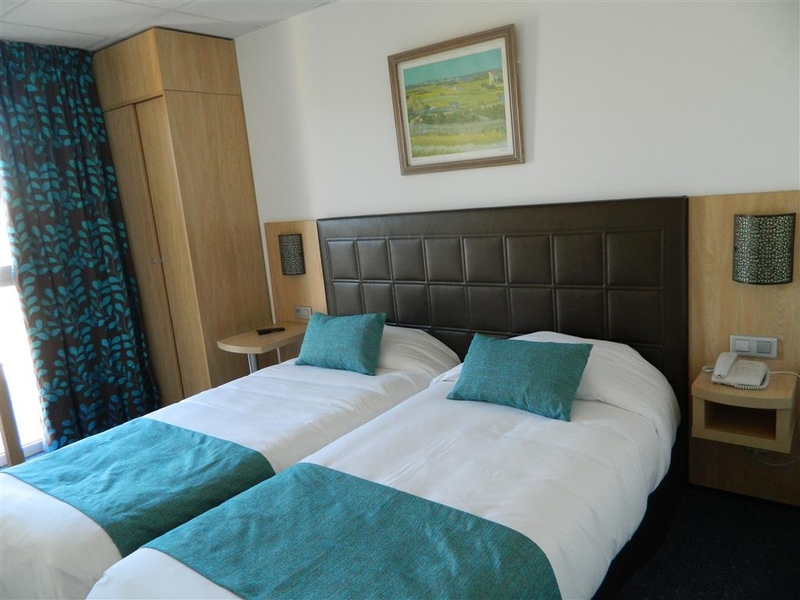 "Fantastic location in a lovely place"
This hotel is in an ideal position behind the Tourist Info centre and is in walking distance to all the main sites. Rooms are very quiet and ideal for your stay. Many cafes and restaurants are nearby. If arriving by train and have heavy bag it would be better to catch a taxi to the hotel. "Friendly staff, good location, decent room." The room was very clean and the location was perfect for us. Parking at the hotel is available for a cost and you need to pre-book, however there is a covered car park across the road that charges a similar amount. We were thankful that the Air-conditioning in the room could be adjusted as the weather was very hot when we visited. It was nice to sit in a cool room. The desk staff were very helpful and friendly and spoke really good English too. The location is in the centre of Arles in which you can walk to the main areas within minutes. Very convenient. Would happily stay again. The only negative is that the Bar was closed very early and had to use the vending machines for drinks. "Where do they find the staff?" We were looking for a place outside of the main part of Arles with parking and this was a perfect choice. Staff was friendly and helpful. Room was spacious and also with free wi-fi. Location is an easy one minute walk to the sights in Arles and about a 15 minute walk to the Musee de l'Arles. We would stay here again. "This place was pretty cool!" Our GPS led us on a merry adventure thru some seriously tight back alleys & odd parts of town to get here, and initially I thought uh-oh. Pulled up in front, there's a nice little spot big enough for 2-3 cars off the road, darted in, and it was the fastest check-in I've ever had! Back in the car 2 minutes later, one left turn & 100m later safely tucked in the underground car park, and in the room 5 minutes after that. Pool is up on the roof, which is neat; great views. Then learned just how close to the action we were. Maybe 5 minutes walk to the arena; pedestrian zone is about 2 minutes on foot. A/C works great; room got cool & stayed that way. Everyone was happy, I'd stay here again. 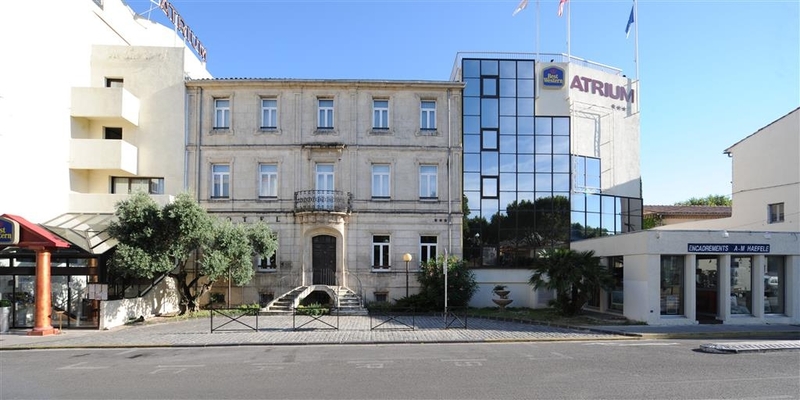 "Good hotel in the centre of Arles"
The Atrium is a good quality hotel in the centre of Arles with on site secure underground parking, good rooms, a rooftop sun deck, pool and a restaurant not far from the autoroute. The rooms are good, the staff friendly and it is well placed to explore Arles but also very quiet. "Very nice hotel very well located"
Very comfortable bedroom with coffee and tea available, parking inside (should be booked in advanced) and good wifi We did not have breakfast in the hotel as it felt a little expensive. We stayed 1 night and could enjoy all the nice places that are nearby. This hotel is not as advertised. The pictures don't reflect what you get. The patio upstairs had no furniture. When we complained, they put plastic tables and chairs up there. There is no working bar, restaurant or even staff for a drink until 7:30 PM. The room is so small you can't move your luggage around in it. The beds are VERY uncomfortable and low to the ground. Except for one woman on day staff at the desk, the service is terrible. I was with a tour and ended up paying for another hotel. I couldn't stay here for 3 days. I asked for a refund on day one for the second and third nights, and told them I was checking out. They refused. Great location to see Arles, particularly the market on Saturday - which is practically outside the hotel. The hotel is clean and comfortable. The room was big enough and the air conditioning worked. The bathroom was well appointed although the shower was in the bath. I really think they should dispense with bath tubs and replace with a proper shower cubicle. The toilet was a bit of a squeeze. The air extractor didn't work but we didn't report it. One of the receptionists was the most unhelpful person I've experienced for a long time. Getting a beer from the kitchen to drink watching a football match was well beyond her. A major fault with this hotel is that it doesn't have a real bar. It has a room called a bar/playroom/music room with a TV and it has a small bar but when we were there they 'didn't gave any staff to man it'. Hence the trip to the kitchen for refreshment. Breakfast was good and well stocked. It has a small pool on the roof which we didn't use. "Small rooms, poor Internet and rude unhelpful staff"
While the hotel is very well located for visiting the weekend market in Arles and the old town area, many of their rooms are quite small and have a weak Internet signal. After complaining I was moved to a larger room in a different section of the hotel with a working Wi-Fi signal. When I arrived at the hotel at 2.45 PM (14:45 hrs), the receptionist (Melanie) curtly informed me that no rooms were available and I could not check in. When I asked to see the hotel Manager, her reception colleague (Elsa?) intervened and asked her to give me a room. Of course a clean room could be found and I was given the key without any delay. Of course Melanie had no comment to make, let alone apologize, although she obviously lied to me minutes ago. When I went up to the room, I found that it was not only tiny but also that the Internet did not work. Back to the reception with all my luggage and again Elsa came to my rescue with a different room. I reported this to Best Western corporate, and while they were very responsive, the hotel did not bother to respond. I think there are better options in Arles and visitors should look elsewhere before opting for this hotel. "Good central location in beautiful Arles"
My son and I stayed here for a week at the end of May. We had a quadruple room - a good size with two single beds and sofa bed - the room would have easily fitted a family with 1-2 children. The room had a small balcony and was at the rear of the hotel, very quiet at night. The air conditioning had an easy to use thermostat and functioned quietly and efficiently. Good, powerful shower over a bath tub and separate wc. The room had a wardrobe with hanging space, but no drawers or shelves which was tricky when staying for a week. A pity because there was ample room. A mini fridge would also have been a useful addition in a family room. The staff at reception were always helpful, although very busy at times as the hotel has large group bookings. We ate dinner in the hotel twice - the food was very good, but there was limited choice on the menu. Breakfast was a little disappointing for €11 and not always consistent in the choices available. My son swam in the little rooftop pool every day - unheated but very pleasant. 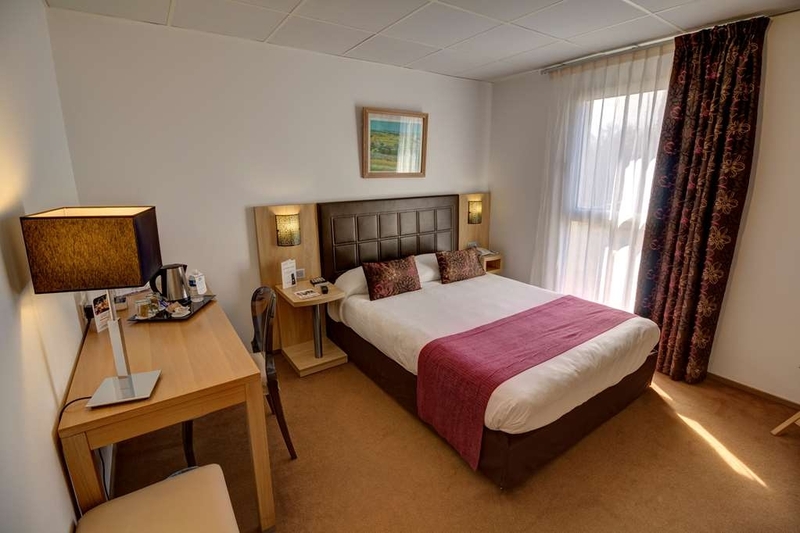 The hotel is ideally situated on the edge of the town centre - an easy 5 minute walk to all the main sites, 10-15 minutes to the train station on the other side of town. We particularly enjoyed a stroll every day along the banks of the Rhone. Arles is an exceptionally beautiful town, friendly and safe, without the hustle and bustle of Avignon, and I'm glad we picked this hotel as our base. Thank you to all the staff at the Atrium for a very pleasant stay. "Good hotel but out of season feel to it"
Stayed here at the end of may and was happy with the hotel and its location. The bar and the restaurant in the hotel however was not open when we stayed. 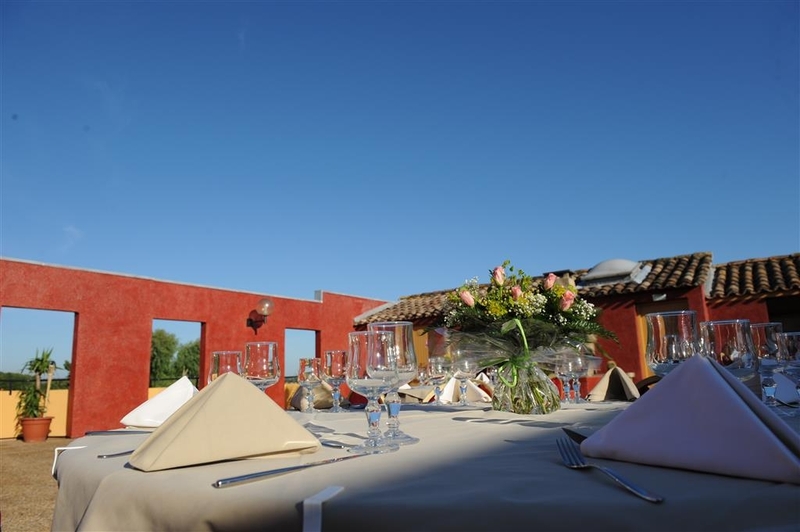 The staff were welcoming and the location was perfect for visiting the camargue. We stayed at the Best Western Hotel Atrium in Arles, France with two other couples while we toured France and Italy. Overall our stay was good. We had issues with the air conditioning as the theromostat was set to where you really could not change the temperature unless you wanted more heat. Thank goodness we had a window we could open, or the room would have been stuffy. Our only really negative issue was the first morning at breakfast. The hotel breakfast cost 11 Euros (roughly $15) per person, and consisted mainly of pastries, yogurt, beverage, fruit, and boiled eggs. The had a small buffet area where there was a sign for scrambled eggs with sausage. The pan was empty, and when I pointed to the pan and asked for more eggs, the rather large-bottomed woman working in the restaurant began to berate me in front of other guests. I have no idea what she said as it was in French, however, I could tell by her mannerism and body language that she was angry. We chose NOT to dine in their restaurant from that point forward ... and you can get a really nice breakfast consisting of omelet, juice, coffee, and sweet roll for about 5 or 6 Euros about 1/2 block from the hotel. The remainder of the staff at this hotel were exceptional ... I can only assume we caught this one lady when she was having a bad day. "Basic Hotel with Great location"
The reason we stayed here was location, location, location - within walking distances of all the historical areas and events. Great location scene with large plaza with Tourist Office and Carousel directly across the street. Close to shops, restaurants, post office, etc. Note: that if you need a parking space either email or call the hotel in advance to ensure that they have one reserved for you (this is not stated on the website). The hotel parking garage is small (approx 20 spaces). We arrived early and was informed that since we did not reserve a parking space (even though I had requested it when I made the reservation) that there was none available. We had to wait until 2:00 pm for people to leave otherwise there was a nearby public garage. They held our luggage for us so it wasn't sitting in our rental car and found street parking (parking meter). We came back at 2:00 p.m. and we were given access to the garage but had to wait until 3:00 p.m. since our rooms weren't ready. Note: It's easier to load and unload the luggage from car in the garage since there is a direct elevator into the hotel otherwise you have to drag it up 10 steps through the front door. When I made our reservation, I requested our rooms (just 2 of them) be close together since they were the same type of rooms but we ended up on the opposite ends of the buildings and on different floors. A lot of groups stay here and when that happens the staff can be overwhelmed. The room was good size, clean and the beds comfortable with everything in working condition. The bathroom was European style where the toilet was in a separate small room from bathtub and sink. There was a in-room safe, small refrigerator, coffee maker, 1 complementary water bottle, flat screen tv, hair dryer, etc. The housekeeping staff was very efficient and friendly. The hotel had a lovely roof top swimming pool which we did not have time to enjoy. We decided not to pay for the 11 Euro or 5 Euro breakfast at the hotel since the breakfast room tend to get crowded and busy with groups. Each morning we walked across the street and paid 7.50 Euros for a continental breakfast at one of the cafes where it was quieter, more relaxed and we got to met the local people. The wifi in this hotel was strange. On arrival you were given slips of paper with the access info which lasted only 24 hours and then you had to walk downstairs and get another. They had a basket at the front desk with these access codes but if they had been sitting there a while the codes weren't any good. Since we stayed here a few days it was awkward and annoying. This hotel was a basic hotel - not great but not bad either. "Except for the bugs and no AC it's well situated"
This hotel is very well situated in Arles. Near the major attractions and some very good restaurants. I'm writing this review from the room. The reason I'm doing this is because there's no air in the room. The fan does not work at any speed nor does the AC. I guess I can understand the central heating and AC must be switched over. I could understand if I was in a third world country....oh wait, I have been to third world countries and I had on demand AC or heating. Wouldn't mind sleeping with the patio door open but I have an aversion to sleeping with bugs in my room. This problem wouldn't exist if the door had a screen. When I booked the room I thought twice about booking at a best western in France. I should of gone with my first impression. Shame on me for not asking if the room had any kind of air circulation. very convenient downtown location. staff is very helpful and tourist office is just across the street reserve parking in basement as parking otherwise would be a challenge. downtown market right out their doors on Saturday is a delight. this location is n easy walking distance of some of the Roman ruins, etc. This hotel supplies only the very basic...no shampoo, no shower cap, thin towels.The printer ran out of paper and ink and there was no more ink to refill it. The heating in our room wasn't working and after asking for help 3 times it never got fixed. The elevator broke down the day we left and we had to haul our bags down the stairs.All problems were dealt with with a shrug of the shoulders. Tour buses were running outside the front every day. Stay at your own risk! "tres bien but not luxury"
We were a group of 35 that arrived at Arles at 5:00 pm. The rooming list had not been sent to our tour director. Half of the rooms had no electricity and by the time we left for diner at 7:00 pm, they still had no electricity. By the time we came back from diner, luckily the electricity was back. But the young lady at the front desk was overwhelmed. For breakfast, apparently our group had a reduce rate breakfast. But you would thinks that with the fact that half of the group had problems with their rooms at their arrival, you would compensate by making it a bit nicer. No! The gentleman at the front desk had no idea of the troubles and clearly didn't care Although the hotel is in the best location. DO NOT GO THERE. 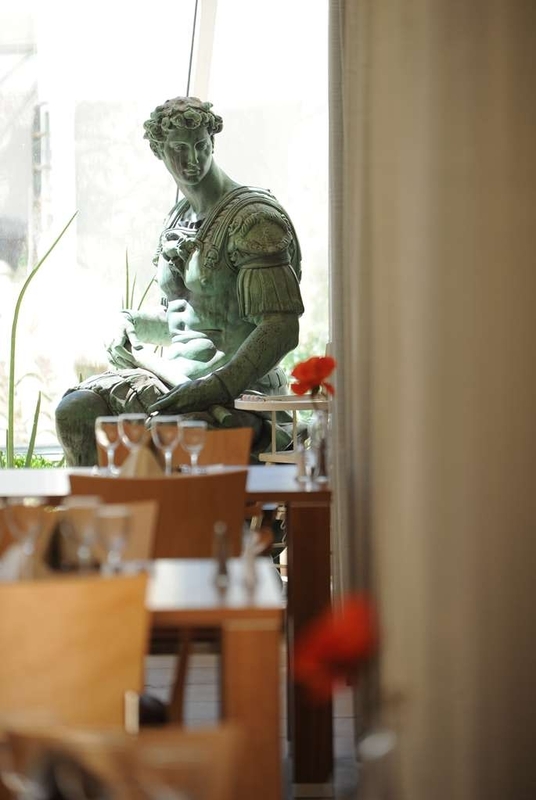 "Nice hotel, very central to restaurants, the cloister and the arena at Arles." Very comfortable hotel with wonderful front desk staff. Room was super spacious and the beds were comfortable. We wanted to book breakfast and glad we did not pay in advance, the breakfast at 9:00 am was well picked over and not re-stocked. That being said, there are loads of restaurants around and this should NOT deter you from booking a room at the hotel. I was feeling ill and the bed with duvet was a welcome comfort. I chose this hotel because of its location and parking garage. The location turned out to be great, central and close to everything. The gated garage adjacent to the ground floor hall was small (15-20 cars) and the smell from a backdoor of some kind of a food store was pretty bad. And it cost 14 euro per night. The facilities are quite dated, especially the carpets in the halls. The room was fairly small but clean although dated too as was the bathroom. We opted out of their breakfast (12 euro). Wi-Fi reception was good. 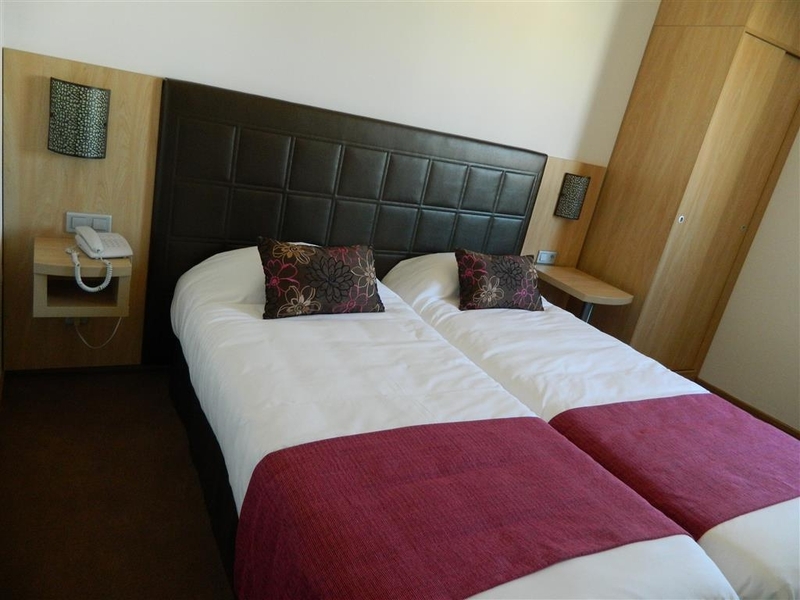 This is a basic hotel, great location steps from the city attractions. Has its own parking lot. Rooms are clean and comfortable but on the small size. wash room can be a challenge for those with any health issues. Great choice for arles on foot. We did take a taxi from train station, otherwise everywhere on foot. We even walked to hertz to pick up rental car. They have a very small underground parking lot for 14 e a night, there is on street parking, and an above ground lot very close. Room was nice, a/c worked great, very quiet. Nice roof top deck where we had our cocktails and after dinner drinks- we provided. They have a bar but we never saw it open in the 3 nights we were there. Internet ok, can't send pix but email etc ok, you get a new code every day and a separate one for every day. Price was right. As an American I have a few gripes. All the toilet tissue france was bad, this was small squares from a dispenser. No toiletries or soap, just a gel dispenser supposed to do it all. Tub was very high and slippery with nothing to hold on to. We did not eat here at all, had 5e express breakfast one day, juice, coffee, and croissant. 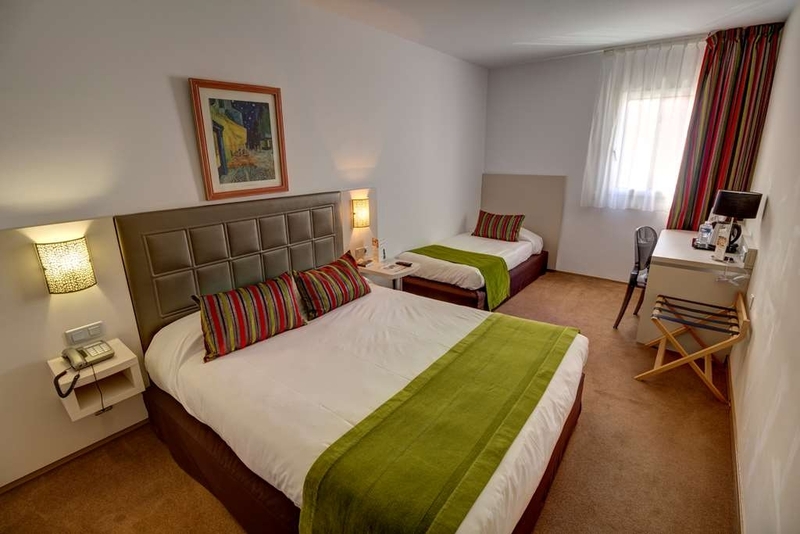 "A few minutes walk from Arles old town"
Good value for your money with convenient location, clean room and washroom plus very friendly English speaking staff. Parking lot if needed is available. There is a roof top pool if you would like to have a swim. Nothing too fancy, but the kids did enjoy swimming. The Saturday market is right there if you are staying Friday night. I would stay there again. my first experience in Arles was good. The hotel is well equipped with a parking in the building available only with booking. The position is good: on feet to the center and near the tourism office. All the cultural attractives are nearby. The shops are closed in the center in the evening so probably this was a pity for all tourists. The room was small for 3 but comfortable. No frigo-bar inside. The breakfast was very good. "Very small room, disabled unfriendly entrance"
Just as you step in , there is a 5 steps stair to reach the reception, no elevator, you have to climb up with your luggage. It is a disabled unfriendly entrance. The triple room is tiny , we had to put the chair in the small balcony to gain some space! the carpet floor could have been cleaner. The shower holder is loose and the shower keeps on going down. In Arles you can rent every kind of room and this is probably the reason why Atrium is fully booked. "Inexpensive 7 Convenient, but dated tourist bus hotel"
Could not be better situated and very functional and most of all extremely cheap hotel in the Center of Arles. Free parking on street. Decent breakfast buffet. Helpful staff. Rooms and especially hallways are very dated and worn. Pool is a good one- on roof with great views. Easy location to get in and out of Arles but still close to all the sights for walking. excellent postition with wonderful parking(extra) value for money,polite and helpful staff with all facilities one could need.Beds comfortable and rooms clean with coffee.No fridge,but not the end of the world! "great location and exceptional staff"
we love the location of this hotel and have stayed here several time because the staff is wonderful - they are friendly and helpful. we use this as a base for biking in southern France and they kindly allow us to leave some luggage at the hotel until we return after biking for a week. the rooms are a little dated but the beds are especially comfortable. When we travel, I usually book with airbnb. 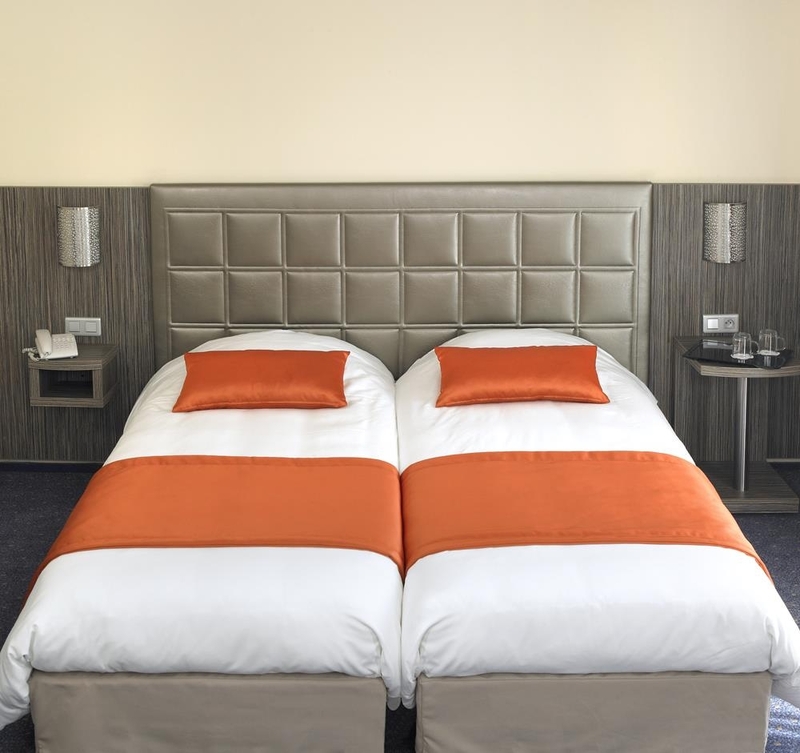 However this time when travelling with my family to Arles, I chose Best Western for it's location and value. It is located right across the street to the tourist center with rate 75€ for three persons in a spacious room with a balcony (low season perhaps). From the hotel, we walked to most of the tourist sights and restaurants. It is very convenient to live here. The staff are very friendly and helpful. The hotel offers free in-room high speed WIFI and complementary water bottle. We were very satisfied with Best Western. "The place to stay in Arles"
We have been coming to Arles for 2/3 days for many years. We always stay at the Atrium as it is friendly, has good facilities, including the garage, and is handy for the town. The rooms are quiet and clean and the staff are always friendly and helpful. We shall continue to come.